Most Outstanding Coach Award – Rev. Francis Neil Jalando-on. Congratulations CPU Table Tennis Women and Coach Francis Neil Jalando-on! Congratulations Central Philippine University and WV PRISAA! CPU Softball Team showed their might against University of Cordilleras (UC) Softball team, winning the championship game at 8-0. The CPU Softbelles held UC team scoreless in all of 5 innings. It’s game over for the 2014 National PRISAA Softball games and the CPU Softball Women is left standing with the championship on hand. TAGUM CITY – CPU Softball Team will try to regain the championship crown they lost in last year’s battle against CAR (Cordillera Administrative Region) team. The team advanced to the finals after beating Region 10, 16-1 in yesterday’s game. Please read this news excerpt dated 10 April 2014. Representing Western Visayas, CPU Softball Team topped the elimination in their bracket by defeating Region 3, Region 7, and host Region 11 here in Tagum City, Davao del Norte where the annual National PRISAA Games competitions are being held. They will face Region 10 from Cagayan de Oro, ranked 2 in the other bracket, in the crossover semi-finals tomorrow, April 10, 2014. On the first day of the competitions, the WVPRISAA softball team first faced host Region 11 softbelles. Being this year’s host, the Southern Mindanao PRISAA team presented a big threat for the Region 6 batters for their home court advantage. With the crowd cheering for the host, the game started strong for Region 11 as they scored their first run in the first inning via a home run by Pitcher Estoconing. But the WVPRISAA girls battled back in the bottom of the first inning by scoring 3 runs via 2 quick runs when Ma. Diane Treyes’ bunt resulted to an RBI and a run via a throwing error by pitcher Tampos to the first base thereby plating Tweedle Gee Samson. A sacrificed fly-RBI by Geia Lyn Dechosa plated Ma. Kristin Gulfan to close the first inning. The first inning dictated the tempo for the next innings for both teams. With accurate pitching by Jane Daras and Dechosa, the host team struggled to score in the next two innings. Accurate and controlled hitting by the WVPRISAA caused errors on the field, allowing them to score four more runs. A changed of pitcher from Region 11 in the fourth inning shortly controlled the game defensively and allowed them to score 2 runs in the fourth and sixth inning, respectively. The Western Visayas Softball Team closed the game with 2 more runs in the bottom of the sixth inning courtesy by an RBI each for Cristine Sebuan and Dechosa that plated Gulfan and Ferly Joy Pagulong for the final score of 9-3 for the Western Visayas PRISAA team. 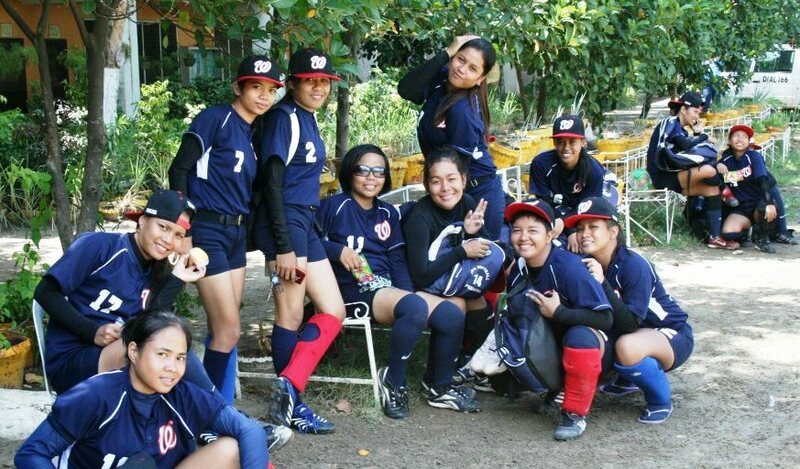 The Western Visayas Softball team then faced Region 3 that Wesleyan University of the Philippine represents. The game turned out to be a short one as the WVPRISAA team won via the 15-run mercy rule. The game ended in the third inning with the final score of 16-0. Gulfan, Samson, and Treyes contributed home runs with RBI’s in the offense for the Region 6 softball team. Daras and Jergen Penafiel controlled mound to secure the win. On the last day of elimination games, the WVPRISAA faced the University of Bohol-bannered Region 7 softball team. Once again, the game ended in the third inning via the 15-run mercy rule with a final score of 33-1. Topping their bracket, Western Visayas Softball team faces Region 10 PRISAA, which is 2nd in the other bracket. University of the Cordilleras topped the other bracket with 3-0 standing and will face host-Region 11 in the first game of tomorrow’s 10 April 2014) crossover semi-finals. The battle for third place and the championship will be played on Friday, 11 April. The Western Visayas PRISAA softball team is composed of the Central Philippine University Softball Team members with one player picked from Saint Anthony College in Antique Province. The CPU students are Ma. Marriel Arnado, Jeraldine Ayore, Jane Daras, Geia Lyn Dechosa, Ma. Kristin Gulfan, Ailyn Grace Lawag, Ferly Joy Pagulong, Jergen Penafiel, Tweedle Gee Samson, Cristine Sebuan, Rhea Sevilla, Herjea Faye Sinogbuhan, Ma. Diane Treyes, Vanessa Mae Zaragoza. Michelle Soriano is the player from SAC. Kim Dela Cruz and Mark Arliss Cloma are head coach and assistant coach, respectively. Pitching Coach is Jose Hechanova. 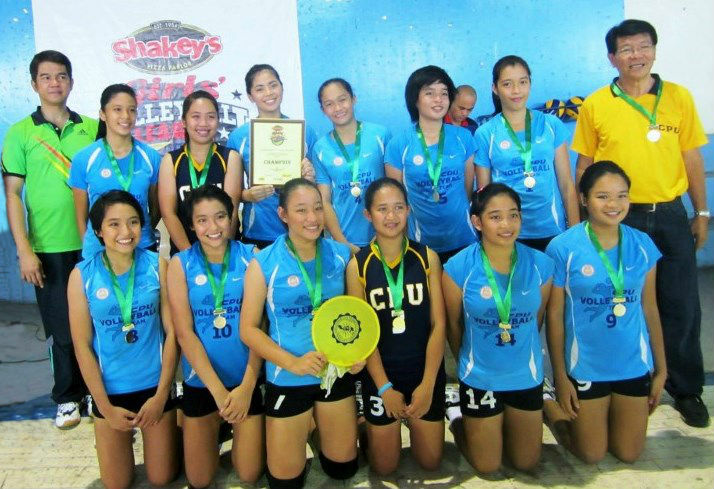 The CPU Volleyball Team Girls represented Western Visayas in the Shakey’s Girls’ Volleyball League Tournament of Champions held at Ninoy Aquino Stadium on 13-19 January. Of course, to earn the right to represent Western Visayas region, they defeated all participating teams in the regional version of the volleyball league. By the way, the team grabbed the championship in the Western Visayas PRISAA meet held 8-13 January at San Jose, Antique. 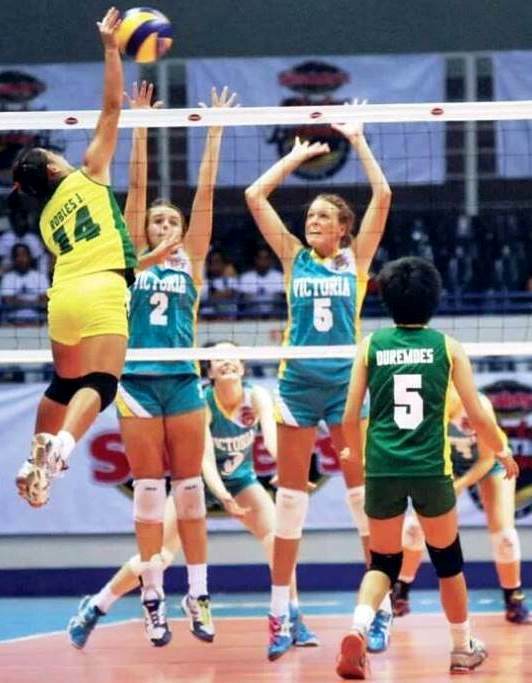 The recent Shakey’s Girls’ Volleyball League Tournament of Champions was participated in by the country’s best, the champions of their respective regions. Thus, the CPU Volleyball Team Girls battled the teams from the powerhouse Hope Christian School, De La Salle-Lipa, University of San Jose-Recoletos, Leyte National High School, Angeles University Foundation, Ateneo de Davao and Baguio City National High School. The teams from New Zealand and Australia made the league more challenging for our young netters. 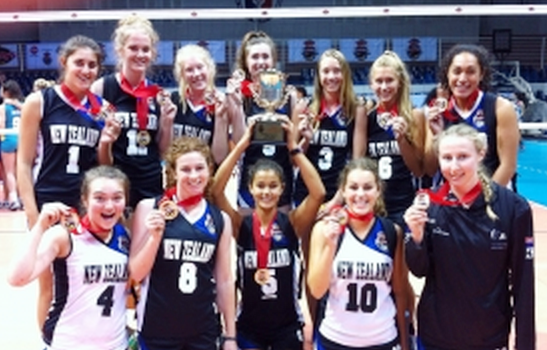 CPU made it to the semi-finals and battled the New Zealand team for bronze. While the CPU team didn’t make it to the final three, I’m sure their participation made an impression. They are a strong team. We have a National Champion Team in the making. All CPU needs to do is strengthen support in all aspects. The wonderful thing about winning national and international sports competitions, like volleyball tournaments, is the university gets good publicity and promotion. I’m sure the teams and the audience as well, know now that there’s a school named “Central Philippine University” in Iloilo City, Western Visayas, Philippines. Definitely, our sports ambassadors deserve the best from our Alma Mater, isn’t it Centralians? CPU Softball Team's tight defense in the last inning proved tough for Region 10. On April 26 morning, the CPU-led Western Visayas team defeated CAR (Cordillera Administrative Region) 18-4. This victory earned them the championship game against Region 10 held in the afternoon. Region 10 started the game strongly by scoring 4–0 runs in the first two innings but on the 3rd inning, Antonette Sacamay of Region 6 delivered Jeraldine Ayore home via “run batted in” (RBI). And with runners on 1st and 2nd bases, Gulfan struck the lone homer of the game for 3 RBIs thereby leveling the game to 4 runs each. Gaining momentum from that scoring spree, Region 6 used tricky offensive plays in the next three innings which enabled them to led 10–4 after the top of the 6th inning. On the bottom of the 6th inning, Region 10 loaded all the bases and scored 2 quick runs on no outs, making the score 10-6. In that moment, Region 6 pitcher Donna Rose Gabayoyo, with two standing outs (SO) and 10 hits on 30 batters, requested for Penafiel to relieve her and end the game. She felt her pitching arm’s injured finger cannot contain the pressure anymore. Taking advantage of the new pitcher, Region 10 pounced at will and scored 5 more runs, wresting the lead from Region 6 at 10–11 as they reached 7th inning. Sensing that momentum is obviously on Region 10, before the last inning started, Kim Dela Cruz (head coach) challenged the Region 6 girls that God brought them together for this moment with their talents and for them to make good use of what God has gifted them. Determined to win the championship, Region 6 showed heart and displayed aggressive and smart plays, producing 5 hits and 4 runs on 2 errors from Region 10. Champions again! CPU Softball Team in jubilation after winning gold in the 59th National PRISAA held in Cebu City, 22-28 April 2012. With the championship almost at hand, Penafiel and the team summoned all their strength, courage and talents to deliver three quick outs for Region 10. Everyone cheered and celebrated when Ayore on 3rd base caught the line drive for the 3rd out. Championship score was 14 – 11 in favor of the defending champion, the Western Visayas PRISAA Softball Team. This year’s Western Visayas Team is composed of: Central Philippine University Team Captains Ma. Kristine Gulfan, Cristine Sebuan, Rhea Sevilla, and Ma. Dianne Treyes; Ma. Marriel Arnado, Jeraldine Ayore, Jane Daras, Clarisse Gaycel Dela Cruz, Donna Rose Gabayoyo, Hainee Dane Hernandez, Jergen Penafiel, Cecil Poblador, Antonette Sacamay, Herjea Faye Sinogbuhan; and, Ronieliza Hiponia and Michelle Soriano from St. Anthony’s College of Antique. Coaching staff: Pastor Kim Dela Cruz – Head Coach; Pastor Mark Arliss Cloma – Assistant Coach; Jose “Julie” Hechanova – Pitching Coach; and, Jonathan Malunda – Conditioning Coach. CPU-led Western Visayas Softball team once again struck gold in the 59th National Private Schools Athletic Association Games held at Cebu City on April 22-28. Composed of the Central Philippine University Softball Team core players, Western Visayas softball team defended successfully the championship they won last year in Zamboanga City. Key to the softball team’s championship victory was defeating Region 10 in the final match on April 26 at Labangon Elementary School Softball Diamond. The champion team boarding a jeep to their game venue. The win enabled the Western Visayas Soft belles to duplicate the feat they achieved in last year’s national PRISAA in Zamboanga City. This was sweet victory for Region 6 (Western Visayas) after they hurdled two games from powerhouse teams. On April 25, a loss from Region 11 posed a challenge to their championship campaign. Resolved to defend their golden crown, the CPU Softball Team recovered from their loss by beating CAR (Cordillera Administrative Region), Bracket B’s number 1 seed, in the crossover semi-finals. With a 0–9 regulation loss against Region 11 in their bracket’s final game on April 25th, the Region 6 Softball team showed what a champion’s heart is made of. The Western Visayas team did not bring any emotional baggage from their previous regulation loss versus Region 11. Showing brilliant strategy, playing good defense and tricky long and small ball offenses, Region 6 shocked CAR with 18-4 win in morning of April 26. CAR’s topping bracket B failed to weaken Region 6 determination to go for the gold. CAR softball team is last year’s national PRISAA runner up. CPU Softball Team’s semi-final game with CAR softball team started slow until the 3rd inning. CAR had scored 4 runs against the lone Western Visayas home run courtesy of shortstop Cristine Sebuan. Tightening defense, Region 6 held CAR scoreless in the 3rd inning until the game was over. Imposing different offensive strategies and almost perfect defense left CAR guessing Western Visayas softball team’s offensive plays in the remaining innings. Central Philippine University’s Softball program and training proved effective during very tight innings and critical situations in the semi-final game. In the 6th inning, Region 6 scored 11 runs using bunts and medium ball placements. Ma. Kristine Gulfan led Region 6 in the offensive end with 4 Runs-Batted-In (RBI) and the same number of hits. In the defensive side, pitcher Jergen Penafiel displayed maturity in delivering consistent pitches resulting to 6 standing outs in seven innings. Beating and clobbering CAR softball team with overwhelming margin, Region 6 was headed to their second consecutive championship game against Region 10 in the afternoon of April 26. The champions relaxing under the tree shades while waiting for their next game. 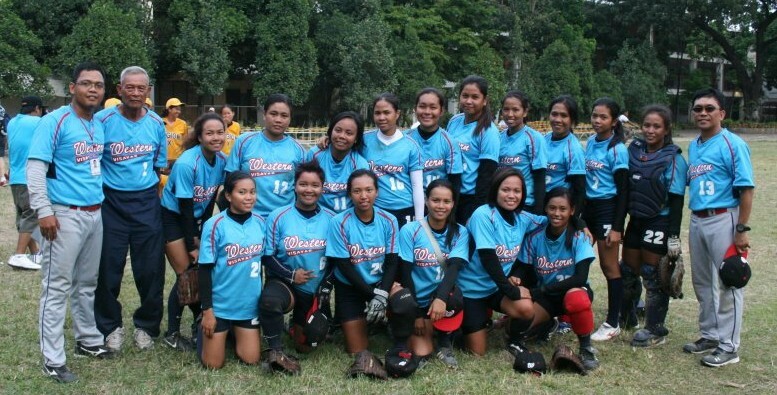 Read how Central Philippine University Softball Team won the Championship in our next post!